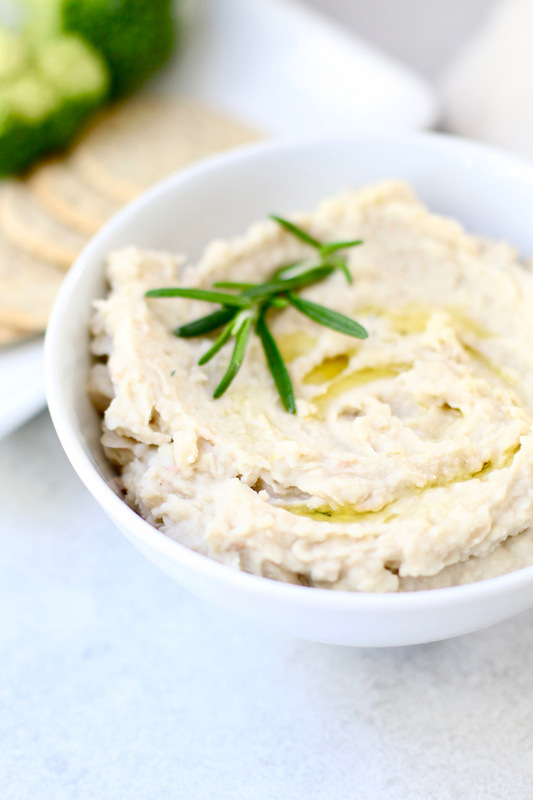 This rosemary white bean dip is an easy, healthy appetizer that’s packed with flavor and good-for-you nutrients to help prime the body for pregnancy. Also, dig into my Fertility Foods Cookbook Review that’s hot off the press! I received a copy of the Fertility Foods Cookbook written by my registered dietitian friends, Liz Shaw and Chef Sara Haas. Though you may not come to my blog for content on fertility, odds are you or someone you know can use this cookbook now or in the near future. Even if it was written by perfect strangers, I would share it with you because it’s an invaluable resource. This cookbook is a true labor of love. Liz and Sara share their honest and personal stories with complete, well-cited research on the link between food and fertility. In the book, you’ll get over 100 nutritious recipes all designed to promote optimal fertility. They cover the dairy debate and pesticides on produce, as well as, key nutrients like calcium, folic acid, iron, vitamin D and choline. To make it easy to find recipes for each key nutrient, they’ve included convenient tables to help you quickly locate recipes to meet a specific need. You’ll also get a “fertility focus” footnote explaining how each recipe fuels fertility. 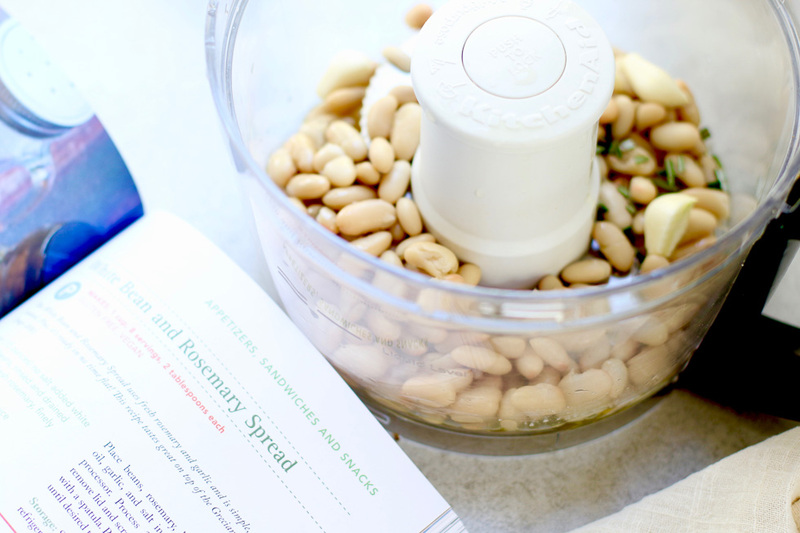 I had a hard time deciding which recipe to make but landed on this White Bean & Rosemary Spread on page 107. 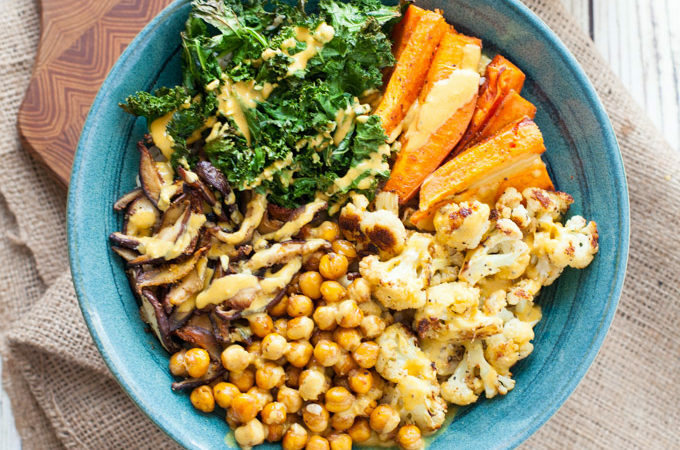 I had many of the ingredients in the kitchen and you know how I love my pulses and garlic! 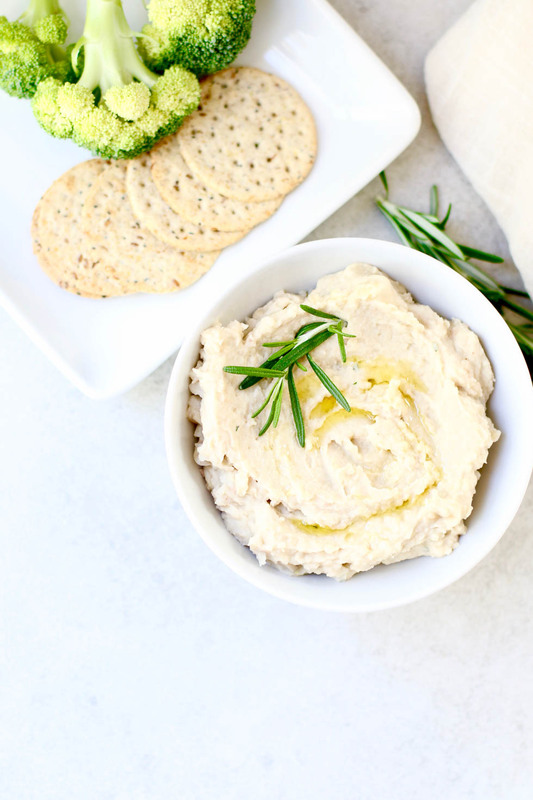 It’s a delicious snack or appetizer for a crowd or an easy spread to pack for lunch with a some crunchy veggies and whole grain crackers for dipping. This recipe is just a taste of what the Fertility Foods Cookbook offers. Along with complete nutrition information, you’ll find a variety of recipes for any time of day – including dessert. 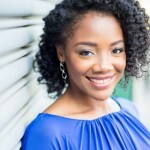 The book is an excellent resource for both men and women. You’ll want to read it cover to cover and keep it within reach on the bookshelf for regular reference. Ready to get your copy? Check it out here or at a bookstore near you! 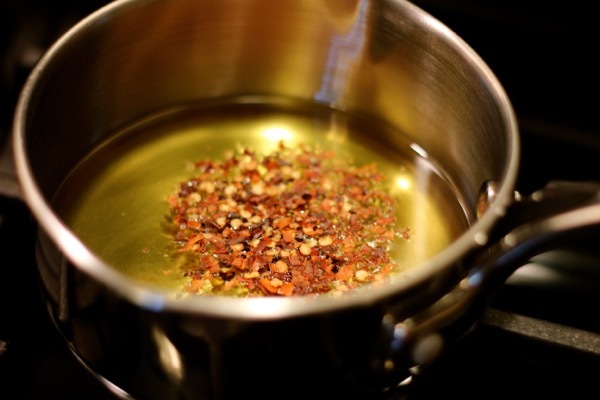 Place beans,rosemary, lemon juice, olive oil, garlic, and salt in the bowl of a food processor. Process 2 to 3 minutes, then remove lid and scrape down sides of the bowl with a spatula. Pulse an additional minute, or until desired texture is reached. Storage: Store in an airtight container in the refrigerator and consume within 3 to 5 days. Reprinted with permission from Fertility Foods, 100+ Recipes to Nourish Your Body While Trying to Conceive by Elizabeth Shaw, MS, RDN and Sara Haas, RDN, LDN, Hatherleigh Press, 2017. 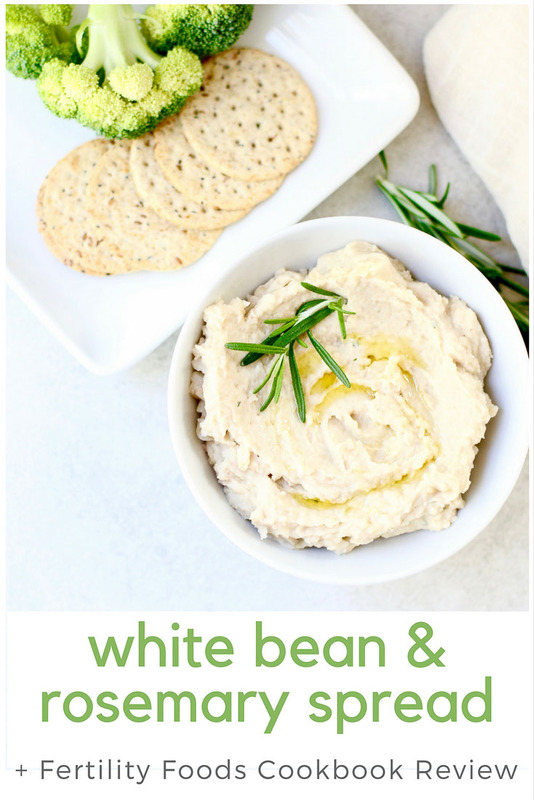 4 Comments on White Bean and Rosemary Spread + Fertility Foods Cookbook Review! What an amazing review and lovely photos! You’re so kind to be so supportive and we’re so lucky to have such amazing colleagues like you!